Gentiana septemfida, Crested Gentian or True Gentian, is an easily grown perennial plant belonging to the family Gentianaceae, and is a native of Turkey, It is a truly beautiful plant, forming strong clumps and throwing up dozens of 9 to 12 inch stems, each topped with a large bright blue trumpet shaped flower. They make excellent rock garden or border plants and provide a strking show when in bloom. The plants thrive in loamy well drained soil in a sunny location, except in hot dry areas in which they tend to do better in a partially shaded location. 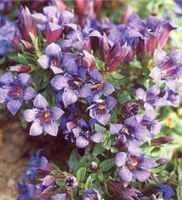 Gentian is easily propagated by division of existing plants or by sowing seed. Seed should be treated as follows for best germination: Warm stratify (see Warm Stratification for more information) at 70F for 2 weeks, then Cold stratify (see Cold Stratification for more information) at 40F for 4 weeks, then sow in pots or trays and keep moist and at 50F until the seedlings appear. Grow on at 50-55F. The seedlings should be transplanted to larger containers when they reach about 2 inches in height. They can then be planted outdoors when all danger of frost has passed. Space the plants at about 8-10 inches apart in the garden. Heavy clay soils should be broken up with compost or peat and a scattering of sand. Gentian root has been used for thousands of years to treat exhaustion and as an antidote to poisons. It has a very bitter taste, which makes it valuable as a stomachic and it has been often used in commercial bitters.